If Vengeance was his dress rehearsal, Antonio Margheriti truly nailed the Gothic EuroWestern second time around with And God Said to Cain. Entrusting long term collaborator Riccardo Pallattini with the moody, chiascuro tinted photography and allowing baroque interpretations of sound design to underline the atmospheric dread, the film is a stylistic feast for the senses. 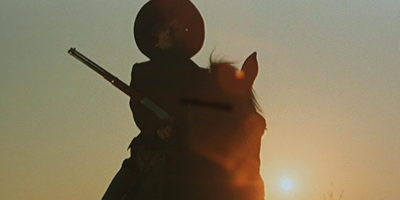 Less a Western, more a dust-bowl exercise in stalk and slash, And God Said to Cain shrink-wraps the by-now-on-the-wane-spaghetti, repackaging it as a near perfect post-Django, pre- Fulci expression of frontier horror. Near perfect that is, because Carlo Savina's Tom Jones-esque title theme is somewhat out of place in this otherwise simmering, windswept essay in revenge.